In July 2018, the Government of Uzbekistan introduced an e-Visa for travelers from 101 nationalities. The e-Visa will replace the bureaucratic system of having to go to a consulate and/or sending off your passport. E-Visas are issued for stays of up to 30 days in Uzbekistan, with a single entry. They are valid for 90 days from the date of issue. Simply fill out our online application and pay the visa fee – you don’t have to send any documents by mail or visit an office in person. Once your visa application is approved, you will receive an approved visa copy via email. The Uzbekistan e-Visa is valid for 90 days from the date of issue and is a single entry visa. The Uzbekistan e-Visa is for short stays (maximum 30 days). The Uzbekistan Immigration department requires all visitors to have a passport that is valid for at least six months from the date of arrival. If you stay more than the 30-day maximum stay in Uzbekistan without renewing your visa, you may face legal action and be required to pay a fine. Also, it may not be possible to apply for an Uzbekistan e-Visa in the future. The e-Visa can be used on all airlines and at all airports in Uzbekistan. Super rush processing times for Uzbekistan e-Visas are approximately 2 working days. The e-Visa will be emailed. When passing immigration in Uzbekistan, travelers will have to present the electronic visa in printed or electronic format, and show a valid travel document. If there is a discrepancy between the e-Visa and the travel document, the e-Visa is considered invalid. Children under the age of 16 do not need a visa. Visa-free entry, temporary stay and departure from Uzbekistan is permitted for foreign citizens under 16 years of age, if they have a foreign passport or biometric travel document and are accompanied by their legal representatives. 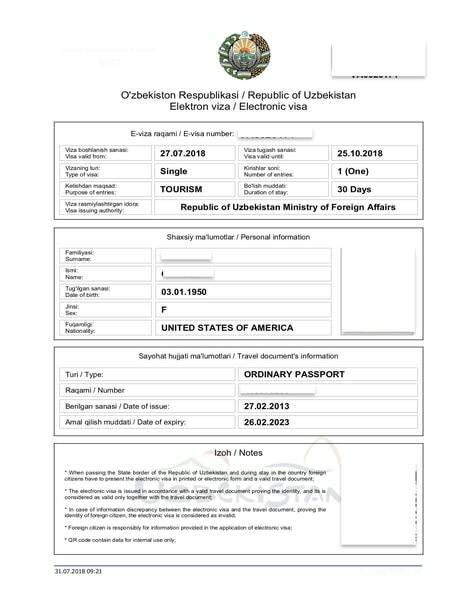 An e-Visa is an official document permitting entry into and travel within Uzbekistan. It is an alternative to visas issued at Uzbekistan missions and at ports of entry. Upon arrival at the port of entry, you are expected to present your passport and a printed copy of the e-Visa. The e-Visa costs 20 USD. Additionally, there is a service fee of 35 USD for standard processing. For rush processing and super rush processing the service fee is 65 USD and 100 USD, respectively. Super Rush Processing: 48 hours. The e-Visa is valid for 90 days from issue. This means you must enter Uzbekistan within 90 days of issuance. What conditions must my passport meet for the Uzbekistan e-Visa? Your passport must be valid for at least 6 months from the date of entry to Uzbekistan and have at least one blank page. What is the maximum stay allowed with an e-Visa? The maximum stay allowed is 30 days. What nationalities are eligible for an Uzbekistan e-Visa? Uzbekistan is a country that is usually overlooked when people seek a vacation destination. Why? Because there are many common misconceptions about the place. Most of all, you will hear people saying that it is not safe to go to Uzbekistan, especially if you want to go there alone. Needless to say, they are wrong. Almost nothing happens to people who visit Uzbekistan, and one way of disapproving that myth is by going there yourself. As you can imagine, before traveling to Uzbekistan, some research is in order. You need to learn how to get around and manage in several situations. Plus, it helps you if you know some things about the Uzbek culture. Below you will find the essential things you need to know about Uzbekistan. Communication may be an issue for you if the only language you speak is English. Not even the children know it since we are talking about a former URSS country. People there speak Uzbek, which resembles Turkish. If you know Turkish, you may understand some of what people are talking about. They also speak Russian (everyone speaks Russian,) and the older generation may know some German because they were taught in school. But other than that, you may have a hard time. It cannot hurt to learn some basic phrases before you leave so that you can be sure that you can get around. Moneywise, you are in for a treat. In Uzbekistan, the currency is the Uzbek som. However, there are a lot of soms in one dollar (and even more in a Euro.) Plus, the bills are small, so for $100, you need to carry a bag of money like a mobster and I mean that literally. You cannot fit them in your wallet. Never. You can exchange them at the bank or at an exchange office, but you should never go on the black market for soms. It was a common practice a few years back, and you could exchange money even at grocery stores. However, that is illegal now, and you need to go to the bank. The easiest place to find accommodation in Uzbekistan is Bukhara. You will see a lot of hotels and hostels. The fees are okay, and the service is satisfactory. One thing that you need to remember concerning accommodation is that whenever you leave the hotel, you need to fill in and sign a registration paper. Keep all your registration papers until you leave the country. That is because you will need them to present as proof at the border. Sometimes, officers on trains will ask to see them. So hold onto them. Lastly, you should never couchsurf. It used to be another common practice in Uzbekistan, but now it is illegal. If caught, you can find yourself in a lot of trouble, and the host as well. If you are a vegan, you will have a tough time in Uzbekistan. That is because the Uzbeks eat a lot of meat, and there is almost no dish without it. Also, you will be looked at curiously. Some people will ask you what the purpose of not eating meat is. Even the vegetables are fried in animal grease. You will not starve, that is for sure, but you will not be full either. The traditional dish in Uzbekistan is the plov. It contains rice, meat, and at times, some eggs. It is delicious, and you should try it. The Uzbeks also drink a lot of tea, with meals and without. It does not matter that there are 95 degrees outside. When asking if you want to drink alcohol, an Uzbek will tab the back of his or her cheek. The people in Uzbekistan are terribly nice. Tourism is not exactly frequent so they will express their curiosity. But they are very hospitable, and in some cases, they are nosy. If you are a woman over 25 who is still single, the Uzbeks will not refrain from asking you why you are not married. Some of them will even say that by the time they were 30, they already had four kids. You do not have to take it personally, and if you can make a joke about it, you should. Keep a positive attitude. They do not ask that question to insult you. They are just curious. Getting upset will not do anybody any good. Uzbekistan’s population is mostly Muslim, but you would not say that just by watching them. That is because the women wear regular clothing, and almost everyone is getting drunk on vodka. They do not express the typical Muslim behavior, which is something that you will find amusing most likely. Even so, Uzbekistan has a lot of temples and other sacred places, which is why you should still show some respect. If you visit such places, dress decently. If you are a woman, you should take a scarf with which you can cover your head upon entry. In order to get around in Uzbekistan, you can use trains, buses, or shared taxis. The most common means of transportation used by tourists is the bus. It is cheap and relatively fast. However, there are a few things you should know. If you are taking a long trip, the bus will occasionally stop so that people who ride it can go to the bathroom, but it does not stop for long enough so that you can get a bite to eat. Pack plenty of snacks. Also, it is illegal for buses to move during the night. There have been too many accidents in the past, which is why you will not be moving between midnight and 5 AM. You will stop in designated places where you can find bars and snacks. You just need to wait for the morning to move again. Uzbekistan is seriously underestimated. It is a beautiful country with plenty of history and a lot of cotton fields. It is safe to go there, even if you are a woman traveling alone. The people are nice, and you will feel welcomed. You will have a lovely experience.